Architect Dion Neutra, who trained, studied and worked with his architect father, Richard Neutra, first spoke with me years ago when I was doing research for an article and we recently re-connected when I was writing about one of Richard Neutra’s signature buildings for a newspaper article. That report (read it here), in which I briefly interviewed Mr. Neutra, revived interest in conserving a Los Angeles landmark, and a full restoration is currently under review. However, the limited scope of our interview, combined with his age—he was 89—prompted me to accept Dion Neutra’s request for a deeper discussion and interview about his work, life and ideas. We met at his home in the Silver Lake area of Los Angeles on the eve of his 90th birthday, which we celebrated with friends and family a short time later at his office. During our exchange, Dion Neutra remembered his father, his childhood and his career with the 20th century’s great modern architect including his thoughts and remembrances of Richard Neutra’s architecture and relationships with Frank Lloyd Wright and Ayn Rand. Dion Neutra also spoke of his own plans and goals and his single proudest achievement. Dion Neutra: —This is the way we treated Eagle Rock in [Neutra: Then and Now]. You can see what a gorgeous shot that is by [architecture photographer Julius] Shulman, how this glass looks in that picture, and compare what it looks like now with the green. Dion Neutra: —I did. I was there that day when they met. It was amazing. What’s funny is what my dad said to her, “You know, of course, who the referenced person is who was mentioned in The Fountainhead, right?” And she said, “Well”— She kind of laughed and said, “Look whose house you’re [sitting] in.” [laughs] [Looking at Shulman’s pictures of the meeting in Neutra: Complete Works] Here they are sitting in the patio. Scott Holleran: Why was Ayn Rand’s house—known as the Josef von Sternberg house at 10000 Tampa Avenue—destroyed? Dion Neutra: What had happened was that in the early 1970s, I got a phone call and the person said, “We owned the property. The house has been unoccupied for awhile. We don’t want to spend the time to fix it up, and we don’t want to pay for a full-time guard to keep out the homeless from camping out in this place. So, we’re thinking of tearing the house down unless you can come up with some solution and a suggestion or whatever.” I said, “Fine. Give me a chance. Let me check it out. I’ll go to the AIA—” At that time, there was no Cultural Heritage Commission or anybody like that. By the time I got back to them a week later, they said, “Oh, we already tore it down.” Gone. So we didn’t even have a chance to go out and photograph it as they were [destroying] it or record it or do anything. Thirty years later, I get an e-mail from a guy who said, “Guess what? I was a middle school student and I lived across the street of that house. I came back from school in the afternoon, noticed that they were messing with it, got my mother’s 8mm camera out, went over, and shot some footage of this which I would be willing to share with you.” So, he gave us these images of the house being torn down. That’s the only record of the actual, physical act of it being torn down. And that’s on the website, by the way. You can see footage of this tractor trying to work like crazy to pull this thing down and having trouble getting it to come down because it was so strong. Scott Holleran: Who was the homeowner at that time? Dion Neutra: I can’t remember who it was. Ayn Rand had owned it for awhile. She sold it to this person who bought it on spec because it was a bigger parcel, and they had in mind doing other things with the site. I guess they hadn’t quite decided what they were going to do with that. They never did call me. First thing I knew, they decided it was too much trouble to deal with it. I went out there one time, interestingly enough, on behest of the L.A. Times; somebody was doing an article. They wanted to go out there and look at the site and reminisce about what the situation was, what’s there now, and whatever. Could you rebuild it there now? So we went out there. And what had happened was, it became part of a tract which was entered from the east side of the tract. On the west side, which is on Tampa, they had built a wall. So you couldn’t even get in from that side. The address, when the house was new, was called 10000 Tampa. And the entrance came directly from Tampa into the house. So, we found our way through the back way to get to the site. It was right after the Northridge quake, maybe just a few months after that. Two houses that had been on the site where the house [was] originally had been so damaged from the quake that they had been demolished. So, amazingly, the site was vacant. So, theoretically, except that there wasn’t quite enough space, one could have rebuilt [Neutra’s von Sternberg house] on the original site! Chop the wall down and drive out to Tampa Avenue; you’d be back again to the way it was. Scott Holleran: What’s at 10000 Tampa now? Dion Neutra: Well, those two houses were rebuilt, and it’s just conventional houses. It was subdivided into a series of lots of which two happened to be roughly in the same location as the original house had been. Scott Holleran: —in the mid-Thirties for Josef von Sternberg and Marlene Dietrich and von Sternberg commissioned your father to build the house, with privacy foremost in mind. Scott Holleran: How did Richard Neutra regard the von Sternberg house? Dion Neutra: He liked it a lot. He made an incredible number of drawings for it and worked really hard on it. He ran across a fabricator who was trying to introduce a system using metal panels as sort of a prefab kind of thing and got him interested. And so, that’s how he veered toward using these sections, both for walls and whatever, which they never were intended to be used for walls. I think it was called Palmer Construction or something like that. So, some of the plans that are still in the archives were made by Palmer for the purpose of building this house. Scott Holleran: Who owns the blueprint for the von Sternberg house? Dion Neutra: I own it. Scott Holleran: So, theoretically, you could sell or license like the Wright estate has been doing. Dion Neutra: Right, I could. In fact, I actually had a client who retained me for the purpose of doing exactly that. Scott Holleran: For the von Sternberg house? Dion Neutra: For the von Sternberg house. He had located a site, of all places, in Ojai. He never consulted me about it ahead of time. But, he made one mistake. He selected a site in an agricultural zone. You’re not allowed to build anything in an agricultural zone. So, he was going to buck the system to get [the government] to [let him] do that. Then, he lost interest. He stopped—he decided he wanted to built only unbuilt houses, not rebuilt houses. He backed away from [reconstructing Neutra’s von Sternberg house]; he hasn’t gone ahead with it. But, yes, it’s a possibility. Scott Holleran: What was the impetus? Dion Neutra: He was intrigued. He thought the house was incredible. He liked the Neutra name. and he thought that it would be good. I said to him, “What are you going to do with it when it’s built?” He didn’t really know. Meanwhile, what he did instead, though, he went to Napa Valley. And he found the designs for what Mies van der Rohe called a glass pavilion, simply a square box with big glass panels around the outside of it. So, he got the rights to use that design, and, actually, he’s building it there. I think it may be done by now, way out in the sticks somewhere, [out in] the far back country of Napa Valley, and I think it’s being used by a winery. In other words, it’s like the visitor’s center where you enter to see the wine and talk about buying cases of wine or something like that. I have not been there, but some other people have tried to drive out there and tell me that there is something happening. So eventually, there will be something there like that. By the way, I worked with [the client] on the restoration of [Neutra’s] Kun house. Kun is the one where Shulman first cut his teeth, the very first house he ever photographed, up on Hollywood—Fairfax and Hollywood Boulevard. That house was in need of restoration, so this guy bought it, commissioned me to work with him, and we worked on restoring that to its original—it was interesting because this guy was a real purist. He wanted to really get as close as possible to the original which meant tearing a bunch of stuff out that other people had done, some of which was not terrible. If anybody cared about cost, I wouldn’t have really advised this. I would have said, “OK. Let’s live with this; it’s not so terrible.” No, no, no, no. Everything had to be torn down. He put the original light fixtures back. I mean, it was incredible. He even reglazed the entire—all the glass was replaced with a special kind of glass that he found that would reduce noise transmission because a tremendous amount of very disturbing noise was coming into that site. But, with the casement windows that we had, you couldn’t tolerate double glass in that room. So, he found a single laminated glass that was not much thicker than the original, reglazed all those windows for $100,000 or something like that. It was unbelievable. He was very sharp. He also managed to get a consortium of people that were willing to spend the money to do this kind of thing. Where we parted company was, I told him, “Look. You’re on a perfect trajectory to reproduce a 1930s house. The refrigerator has got to be a 1930s refrigerator with a motor on the top and the whole box and everything.” He said, “I’m afraid that that’s where I draw the line. I can’t live with that.” So he built—we designed—a piece of cabinetry which is actually the refrigerator, but it looks like a cabinet. Anyway, it was interesting. Scott Holleran: Is the Kun house still like that? Dion Neutra: Yeah. It’s now been sold to somebody, as far as I know, with no restrictions, so the [new homeowner] could mess it up again. We have what’s called a conservation agreement program. If we’d put that on title, then he’d be safe. They wouldn’t be able to mess it up. He didn’t do that. It would not be too late to do it even now. [The new homeowner] should have no objection to having this on title. What it means is [that] if you want to change something, you’ve got to consult first. And you’ve got to make sure that whatever you do is appropriate. So, that was the purpose of it. Scott Holleran: What was your impression of Ayn Rand when you met her? Dion Neutra: She seemed [like an] ordinary [person], though somewhat eccentric. I don’t remember too much except that we had a cordial conversation, it was a nice visit and it didn’t last all that long, a couple hours. I think it might have been the only time my dad met Ayn Rand. For some reason, my dad had the prescience to invite [photographer] Shulman to come along. Scott Holleran: Was architecture what you always wanted to do? Dion Neutra: Actually, no. When I was eleven, my dad said, “You’re going into middle school now. Why don’t you come into the office and let me teach you how to draft because you might be handy in your life.” He never said, “Do you want to be an architect?” He said, “I’ll assign one of the draftsman to work with you, and you can have a table there in the office.” So I was an eleven-year-old sitting with all the grownups, paying attention. That’s kind of neat. So I thought, Yeah. Let me do that. I would spend time instead of playing like other kids did, I would sit there at the drafting table and do various projects: lettering guide, retracing details to learn how—I learned to draw with ink on linen really early on. So, of course, having done that, when I got a little bit older, there was a drafting class offered in school. In those days, they had many more choices. So, I took that and, of course, I got A’s because I was better than anybody else. I did the same thing in high school. You’ll drift to the ones that you know you can do well. Toward the end of high school, this was World War 2, I was going to be drafted in the Army unless I decided to elect one of the other services before my age turned eighteen. Well, I accelerated through school so I was actually only sixteen when I graduated from Marshall High. So, I had a year before I had to make that choice and decided to go to [University of Southern California] which was the only place that had been teaching architecture. So they said, “What do you want to study?” “Well, architecture, of course.” They took a look at my portfolio and said, “Wow. You don’t even have to take the first year. Just skip the first year. Go to the second year right away.” I took the second year. Two semesters. By the time that was over, I got to make my choice. So I did the research and found out that if I joined the Navy, they have a ten-month electricians’ program, an electronics program, and you go to school for ten months before you even do anything else. So, I thought that’s a great way to stay out of the shooting war for ten months; I’ll sign up with the Navy and take that class, and that’s what I did. By the end of the ten months, I shifted to Treasure Island in San Francisco Bay which was a Navy base. I was about to come out of there, and they said, “Would you like to teach the class?” I said, “OK. Great.” So, I taught the class for three or four months. And then, for whatever reason, another change came and then, now, they’re starting to mothball the fleet at Alameda Naval Air Station, which is across the Bay from—So, I got transferred over there, and I worked for three months mothballing the fleet. And moving from one dock to the other, I thought I could get sea pay if I’d get on a ship and move from one dock to the other, but they said, “No. You’ve got to be three miles offshore before you get sea pay.” OK, so then, now it’s the end of my two-year shift, and I’m ready to leave. They come to me and they say, “Hey. We’ve got this great opportunity for you. We’ll give you an increase in rank, thirty-day paid leave, and you’ll get to go to Bikini and participate in the atomic test program. See another part of the world.” Wow. That sounds pretty great, right? I said, “You know what? I’ve had enough. I’m leaving. Thank you. No, thanks.” Everybody who went to Bikini got cancer because of the exposure to the radioactive waves. So, it’s interesting. I’m writing a book called Dion: My Life. That’s my autobiography. And, in that chapter, I’ve got brushes with death. Several things had happened during my life where I could have died. One of them happened when I was only five years old. I cover early sites for the Neutra practice. This is where the Neutra practice started. See if we can get to the first page here: the Schindler house on Kings Road. Scott Holleran: This is the Then & Later book. Dion Neutra: Yes, this is the Then & Later book. And then here, from 1930-’32, my dad set up shop in this little duplex here near Elysian Park. During that time is when he designed the VDL [Research] house, which was built in 1932. So, while I was living in this duplex, we were on the lower floor. The upper floor people were the Lamm family. And Jule Lamm was a kid that was about a couple years older than me who was upstairs. So of course, we met each other, and we would play and have fun. And one day, we decided to walk to Silver Lake from Echo Park to view the site where my dad was going to build a new house. We had obviously heard about it. So, we walked over there, and we looked at the site. And the site is right down the street here. And then, from there, it’s only a few blocks down to the river. So we thought, Let’s walk down to the river and see what going down at the river. So, in getting down to the river, somehow I got into the water, and I got into some quicksand. [I] [s]tarted to be sucked down by this quicksand. The water was already up to here, and I was going down. Jule was standing there on the shore, not knowing what to do. And the next minute, I would have been drowned. But, what happened was, a big log floated by with a big branch. And I grabbed the branch, and the force of the water pulled me out of the quicksand. And I was able to get out. But I could have been dead at age five. No question. So, that’s my first brush with death. Scott Holleran: How much do you remember about that experience of being pulled down? Dion Neutra: It was terrible. It was a hopeless feeling. I was wondering, What’s gonna happen? What can I do? And another interesting corollary to that was just last week. I got an e-mail. We have a museum down here. We’re putting up artists’ shows. You need to see that, by the way. So anyway, one of the artists wrote a note and said, “Guess what? My name is Wendy Lamm, and my father, Jule, who’s ninety-five now, remembers the time when you and he played over in Echo Park.” I said, “My God. I’ve got to see this guy one more time. Is he up for a visit?” And he’ll get a real kick out of this story because it’s memorialized in this book, Neutra: Complete Works. Scott Holleran: But you were only five years old, so, where were your parents? Who was minding you? Scott Holleran: —Did your mother or father change parenting tactics after that traumatic event? Dion Neutra: Yeah. The first world’s fair in San Francisco was, I think, ’37 or something like that. I was sent on the daylight train by myself from L.A. up to San Francisco. I was met at the station by a friend, but they sent me [on] the entire trip without any supervision. Put the kid on the train, give him money for lunch, and that’s it. It was the same thing to me when they sent me to the Grand Canyon by myself two years later on a bus. I went for the weekend to look around and see what I wanted to see, and come back on the bus. Dion Neutra: By myself! It was amazing! When I got there, the very first day I got there, I lost my bus ticket to return home. So, I had been all over the place trying to look around and everything. So, I retraced my steps the best I could, and in the middle of the rail yard where the train comes in from Flagstaff, on the tracks, was a piece of paper. There was my bus ticket. What are the chances of finding that? Scott Holleran: Where did you stay? Dion Neutra: In a sleeping bag, which I brought with me, somewhere on the ground. But it turned out that it rained that night. So then, I found a spot in the El Tovar Hotel, there was a couch, sitting catty corner to the corner. So, behind that was a triangular space [where] nobody knew what was going on behind there. I found that space and put my sleeping bag down there. I spent the night in the lobby of the El Tovar Hotel. Scott Holleran: How old were you? Dion Neutra: Twelve. And then, interestingly enough, fifty years later, I had scheduled a trip to go to Painted Desert, Arizona, which is where we did a big project. They had invited me to come and consult about some changes. I had some time to burn because I wanted to see my son, Greg, who lived in Albuquerque. I can’t remember quite the sequence, but it turned out that I had three days to burn, so to speak, before I went to this meeting. So I asked them, “Could you get me a good rate at the El Tovar Hotel?” Of course, it’s now a national monument. They had an inside track to the management there. So, they got me this second floor suite with a wonderful balcony overlooking the canyon and everything. And so, I’m thinking back fifty years earlier. I’m in the lobby downstairs. Now, I’m in this VIP suite with a gorgeous view. Scott Holleran: Would you say you became organically interested in architecture? Dion Neutra: Yeah. It was a very natural. Dion Neutra: The older brother was injured at birth and never really was able to function. He was in care facilities most of his life. My younger brother became a physician. Scott Holleran: On the eve of your 90th birthday, how do you look at American art and culture? Has it gotten worse or better? Dion Neutra: Well, I think that the one thing that sort of jumps out at me is the fact that with the technology getting more and more sophisticated, we’re able to create all these weird shapes and forms that we never could possibly do otherwise. And we’ve become obsessed about formalism, formism, where it’s like Frank Gehry starts out by wrinkling the paper and saying, “That’s going to be my form, and so, I’m going to fit the program into there regardless of whether it is suitable or not.” So, that’s kind of where a lot of architecture has gone, you know? It’s in that direction. And the publications jump on it because it sells. It’s showy. It looks interesting. Scott Holleran: Tell me about your book STD for Neophytes, an adaptation or revised version of your father’s Survival Through Design? Scott Holleran: So, it’s more streamlined? Dion Neutra: It’s more streamlined and it’s a little easier and more accessible. He talked to me many times about this. He said, “I wish there were a way to get my thoughts across to people in a more understandable way for them. I’m sorry that my book is so hard to read, and I wish it were different.” So, this is kind of dedicated to him because this really is a fulfillment of his dream to try to communicate in a more accessible way. Dion Neutra: —Right. And so, he struggled mightily during the writing of the book. And even after all the editing was done, it still was a very difficult book. Scott Holleran: What did he think of Frank Lloyd Wright? Dion Neutra: He admired him a great deal. Scott Holleran: Why was he with Wright for such a short time? Dion Neutra: Because, what happened was, Wright was on his way to Tokyo at the time. He left Neutra in charge of working on one project or two. By the time that was done, Wright had not come back yet. And Neutra said, “You know what? I’m moving on. There’s not enough work to keep me going, anyway.” He could see that Wright didn’t have enough work, so he was trying to think of what he wanted to do. He decided to move on and join Schindler in L.A. So, that’s what happened. Scott Holleran: Did he remain friends with Wright? Dion Neutra: Yeah. They had a rocky relationship at first because Wright took umbrage at the fact that both Schindler and Neutra made reference to having worked with Wright and [were] sort of riding on his coattails, talked about their practice and how they were launching their new practice. Wright took umbrage at that. But later on, it cooled down. And toward the end of Wright’s life, they were very cordial. They didn’t see each other that often. But when you compare Wright’s work with our work, it’s just extremely far apart. Because when you’re in a Wright building, you feel like you’re in a cave. And you want to get a little glimpse of the outside through some slots here and there. It’s really not indoor outdoor living at all, so it’s a completely different approach. Plus, Wright is a formalist. It’s either triangles today, circles today, hexagons, or whatever. And [Wright’s approach was] ‘that’s what I’m going to do, and your project is going to fit in. You’re going to be a hexagon if that’s the way I feel today’. So, he was guilty of that to a large extent, I would say. Scott Holleran: Did you get to know Frank Lloyd Wright? Dion Neutra: I met him a few times. Yeah. Scott Holleran: In one word, how would you describe him? Dion Neutra: Well, he was officious. He was dismissive of the AIA, for example. He thought they were a bunch of fuddy-duddies. He was extremely self-assured [and thought] he didn’t need anybody else’s support. Scott Holleran: Whereas your father was more collaborative, would you say? Dion Neutra: Yeah. He was much less that way. He was much more collaborative. Dion Neutra: Yeah. My father was extremely accessible and related to clients no matter how lowly they were, if you want to use that term. The most pedestrian people you can imagine were clients of ours, and it never made any difference to him whether these people were wealthy or not. He had this tremendous range of clients. He would have liked to have had [more] wealthy clients, of course, with no budget problems. He would have enjoyed that, but it never seemed to work out that way. So no matter what the client was, he always had constraints to work within, and we did. We found ways to solve the problems. 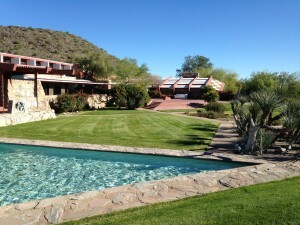 Scott Holleran: Did he visit Taliesin and Taliesin West? Scott Holleran: Did you accompany him or go separately? Dion Neutra: I did not. I never did accompany him to either one of those places. I actually don’t think I ever have been, when you come right down to it. Scott Holleran: You’ve talked about differences. What are the similarities between Wright’s architecture and your dad’s? Dion Neutra: I think Wright likes to characterize himself as an organic architect, but I don’t know whether I understand what he means by that because I don’t see it. Maybe the fact that in some cases he tried to use materials that were found on the site. He would use the gravel or the materials that were on the site and then try to make the building blend in color-wise with the site. Things like that. Wright always found it necessary to ornament his work through stained glass or through hollyhock things pasted on the building or something like that. So, he always had some kind of reference like that which made the building much more rich, if you will, but were things that my dad never did. Scott Holleran: But they did work together. What did your dad learn, if anything, from Frank Lloyd Wright? Dion Neutra: [pause] I can’t really put my finger on it because, like I say, he was only there for six weeks. He did work on a project that involved driving cars up a ramp into a big sort of a mountain, and that was going to be some sort of a center. I forget whether it was a commercial center or whatever it was, but I think it was called Sugarloaf Mountain or something. Their sketches survive of that particular project. But it was kind of a strange thing because Wright left without much notice. I think within a few days of the time my dad arrived there, Wright was gone. And then, he was left alone on his own, and I’m not sure who else was there at the time. 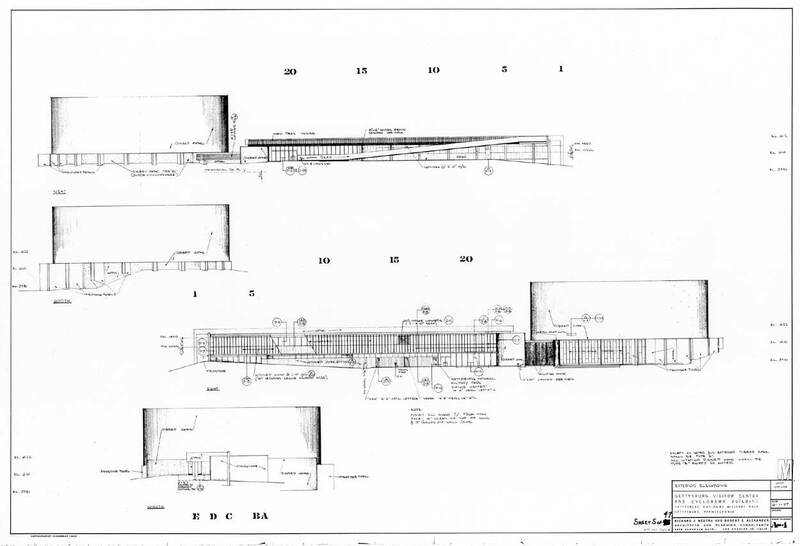 Scott Holleran: Well, how did Wright come to hire Richard Neutra? Dion Neutra: My father and Schindler both admired the Wasmuth catalog of 1908, published in Germany, of Wright’s work. And they were students at the time. So they admired the work and sort of said it would be great to meet this guy somehow someday. Well, what happened was that Schindler actually graduated and was able to migrate to the United States in 1912, and then actually made contact with Wright and started to work for him as his L.A. person while he was doing all these houses at that time. 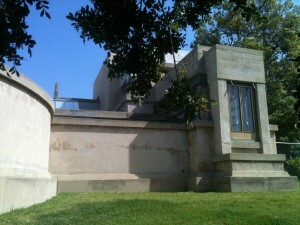 He did a series of houses, Hollyhock House and various, four or five houses, were all done in that period here. So, Schindler was kind of his on-site person. Schindler said to my dad, “Come join me. Let’s work together.” But my dad got stuck in the war, World War I. He ended up being [in] the Cavalry for two years and this and that. So, it wasn’t until 1923 that he was able to come to New York, and then he worked his way to Chicago. And guess what? He met Wright at the funeral of Louis Sullivan in Chicago. Sullivan was buried at a cemetery on the outskirts of Chicago. He went to the funeral, and, of course, my dad recognized Wright right away, walked up to him, introduced himself, and that’s how they met. And then, immediately, he said, “I’ve always wanted to work with you. What are the chances?” So, Wright said, “Well, I never pay anybody for this. Would you work for nothing?” But he agreed to pay my dad $130 per month if he would come to work with him. Scott Holleran: Had Wright seen your dad’s designs? Dion Neutra: By that time, he showed some things, and he saw my dad’s things. I don’t think he had seen any publications. Or maybe he had because my dad had written a book by that time. So, Wright took him on, on very short notice. And, like you say, it only lasted a short time. It’s very much overblown. I don’t think you could say there’s a big influence or anything like that in six weeks or five weeks, especially with Wright not being present at the time. Scott Holleran: How did you deal, as a kid, with the celebrity aspect of it? Dion Neutra: I don’t remember it being that much of a factor. It just went over the top of my head. That’s one of the things I mention in [in a book] is that he would never get down on the carpet with me on my level. He was always talking down to me as a small adult. [That’s] [t]he kind of way it was. We would go for walks; that was our recreation together. And he would expound his latest thinking to me, and half of it went over my head because I couldn’t understand it. But he was paying attention to me, right? So, that’s good. So, that was my relationship to him. It was a cordial, friendly, I would say loving, but not on the level that I could really relate to. It was not his nature to do things like that for some reason. I’m not sure why. Even family meals were a rarity because somehow my father was always busy with something and he didn’t have time to sit down. He didn’t take a break and say, “OK, I’m going to sit there for an hour with the family.” There was always some emergency going on that he had to keep in touch with. My mother tried desperately to create a sense of family, but it was not too successful. I don’t have any resentment about it. That’s the way it was. I’ve kind of accepted it. Scott Holleran: How did you do things differently, as a dad, with your own son? Dion Neutra: I tended to be more hands-on with him and with doing stuff like going to school events, supporting them, and if they wanted to go to sports, do things like that. I’d try to be supportive. But unfortunately, as it turned out, my first marriage ended after ten years. My kids, by that time, were about five and seven. So, I kind of missed out at really important years. Right after that, as a person with partial visitation rights, you don’t really get that much to do. So, I didn’t have a chance to do as much as I would have liked to with those kids. Scott Holleran: What is the greatest physical concretization of your work with your dad? Dion Neutra: One of the greatest that I like to think about is the Gettysburg Cyclorama Center where there are so many wonderful ideas that my dad brought to the table. I was the project architect on that. I worked on that thing from inception. I was out there on the site many times. 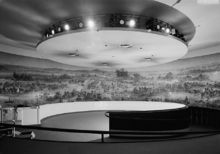 Scott Holleran: The Gettysburg Cyclorama Center was conceived in what year and executed in what year? Dion Neutra: It was conceived in the late fifties and finished construction in 1962 and was dedicated by Eisenhower and received very favorably by the Park Service and everything like that. And I can’t believe that they would later have the chutzpah to say, “We know better than the people before us who commissioned this building. We know better that this should never have been built here.” [The center was demolished in 2013] And that’s the most terrible thing. My e-book on that is called The Worst Preservation Disaster of the 21st Century—that [the Gettysburg center] was allowed to be torn down. As a result of that, I came up with a book design for a table based on a shape that my dad came up with to solve a certain problem in the building. It was such an interesting—it looked like a shark’s nose, so I designed a coffee table using that as a shape. And if you go down to the museum, you’ll see an example of it. Scott Holleran: What was the experience one would have in visiting Gettysburg, and what was the objection that the government parks people had to it? Dion Neutra: Well, there were two things. One was that they made the unfortunate choice of choosing a superintendent who had no appreciation for modernist design and thought it was inappropriate; [the superintendent thought] that the styling of the building should have looked like a Pennsylvania barn instead of like it did. So, he announced at the very beginning [that] his purpose was to see [the Neutra] building removed. And that’s who they made in charge of the building. Scott Holleran: Because of the aesthetic? Dion Neutra: Yeah, mostly. And then he used the location as a [rationalization]. He really hated the design of the building and did everything to undercut it. And so my question is: They’re the [government] Park Service. They have all kinds of people they can choose to be in charge of a building. Why on Earth would they choose someone like that? Scott Holleran: Was there an outcry among war memorial advocates? Dion Neutra: Well, there were [Civil War] re-enactors who, of course, objected to the fact that there was something on the site where the [Battle of Gettysburg had] happened. Those people were the ones who said that the building should never have been there. But that was a very small minority of people. Twenty million people visited that building during its lifetime. We had 5,000 people writing letters, very touching letters, of their memories, [expressing] how important it was to them. Scott Holleran: Coming back to the design and your role in it, why are you proudest of that achievement? Dion Neutra: I took my dad’s rudimentary ideas and then actualized them in the building. Just to give you an example: the Park Service told us, “We want to handle up to 10,000 people in one day at the peak in July, when we have people visiting.” So, how do you handle 10,000 people and get them through this building somehow? So what we did, we came up with a ramp. And the idea was, it was a two-way ramp. You have people going up on one side and coming down the other side. You could have people moving for ten hours a day slowly, slowly moving through, and we actually calculated that we could get 10,000 people at a clip. So, we designed the program when you get to the top, where the painting [depicting the Battle of Gettysburg] was, we designed a program that was no a more than a 30-second announcement: “Look around. You’ll see the painting. This is what the artist saw at the moment of the battle. Thank you for coming.” And continuing down the ramp, around to the right. So, that was [the recorded narration] on the most crowded day. Then, on other days, when it was less crowded, we could stop for five minutes and have a five-minute program. Other days, we could have a ten-minute program. So, designing all the logistics of that is what I did. And there are many other details like that that I enjoyed working on trying to make things work the way Dad had in mind. Scott Holleran: How many buildings did you work on with your dad? Dion Neutra: I’ve never counted. Probably 200. What I’m trying to do is write nine more books covering 20 of our projects. We have 400 [total] executed projects. I’d like to deal with each one and talk about what happened, how it was originally and what happened to it later. I think it’s a fascinating record. Scott Holleran: You’ve talked about Richard Neutra-designed buildings you’ve lost. What’s the greatest preservation success that you’ve had? Dion Neutra: Well, the Kun House is one, very nicely done. Unfortunately, there are not too many. Most of the stories are not happy. I have these stories. Scott Holleran: What’s the greatest commission that you never were able to finish or build? Dion Neutra: Uunfortunately, for me, there are a number of those. A house I did in San Clemente, which would have been a spectacular house, but, at the moment we were ready to go, the market turned south and the value of the house that they were going to sell in order to pay for this other house plummeted and went to less than half of what they thought it was going to be. That canceled the whole project. I think it was the crash of 2008. Scott Holleran: What is the quality you possess as an architect that you share with your dad? Dion Neutra: Well, interestingly enough, an interest in details. But toward the end of his career, [Richard Neutra] became a little impatient because he said, “Look. You should be looking at the broader picture and not be so involved in details.” So he wanted me to have a broader look at stuff. And I would say things to him like, “Dad, you know, the reason these things are so great is that we do care about the details and we make sure everything is just right. So, forgive me if I don’t live quite up to your expectations.” And then, the other thing is, of course, the ability to take the program that is offered by the client and try to expand it to the max; ‘What’s the most that we can get out of this?’ Like Eagle Rock Clubhouse or like the von Sternberg house or like Gettysburg, all those projects displayed an ability to expand the program and bring a much richer result than the client ever asked for or would have thought of on their own. Scott Holleran: And what quality are you most different or distinct or unique from your dad? Dion Neutra: [pause] That’s a good question. [Long silence] My dad had one weakness, I think, when it came to services after the drawings were completed and during construction. He had aversion to being under contract during that period. So, the contract with the client ended when the drawings were handed over. And yet, we were interested in the results. So, there was a dichotomy there, and I pointed this out to him. I said, “This is a weird mixed signal that you’re sending out here. On the one hand, you’re saying we’re done. And on the other hand, you want to be involved or in construction. And, are they going to be paying for this time while you’re involved or in construction, or what’s the deal here?” He just was very ambivalent about that, and we never really clarified it. I tried to make it clearer. It costs money to be on call all the time. Depending on how well the contractor does, if he’s very excellent and does everything perfect, they won’t take that much time. But if he’s not, then we have to spend more time. Scott Holleran: So you brought more clarity to the contracts? Scott Holleran: What was the hardest thing for your dad when he looked at his whole career—what did he continue to find challenging? Dion Neutra: It was his relationship with his staff and with his people that he worked with. I was so astounded to watch how much time and energy he had expended on that as the career developed. Because people are human beings, they have different ideas. People were coming and going all the time and having expectations and managing all that and trying to keep a calm atmosphere in the office occupied an incredible amount of his time. I was amazed that he got as much done as he did considering how much time he invested on that. Scott Holleran: So Neutra’s greatest challenge was managerial, not architectural? Dion Neutra: Managerial was really the most difficult. Of course, when he got into partnership with Alexander in the 1950s, that was a somewhat troubled relationship almost from the beginning. Alexander took issue with the fact that it was always Neutra [who] got mentioned and he was frequently forgotten, second class. So that’s why he quit. He finally decided ‘I’m not going to live this way anymore’. So, he quit. The press tends to try to make a star out of somebody. They don’t appreciate—This particular book [Neutra: Complete Works], for example. I said, “Look. This should be [titled] Richard and Dion Neutra. This shouldn’t be Richard Neutra. I’m involved with most of those projects. Why is it only Richard Neutra? And why does it stop at 1970? Why isn’t it a continuation?” This was published in 2000, [with] 30 years of more work since then. “Why are we cutting it off at that point?” I couldn’t sell [Taschen] on it. Even the cover of this thing, I said, “This looks like a crate from Home Depot, this cover. How can you publish a book about us and have it look like this?” Fortunately, on the smaller version that came out later, we did get the font changed to our font. That’s the one thing that I was able to do. Scott Holleran: Do you make money from selling the Neutra-licensed numbers? Dion Neutra: I do. You would be amazed how many thousands of those numbers are sold every year. And we make like a nickel on each one, or something, so it adds up. There’s a couple of thousand dollars a quarter. It’s astounding. Scott Holleran: Was your dad happy? Dion Neutra: I think so. He introduced his own level of urgency. He felt a tremendous sense of urgency in his life that he needed to get things done. He only had so much time to do it. I don’t know how to express it. He very seldom took time off to say, “Let’s just relax. Do nothing.” That was not his style at all. But, from his terms, I think he had a happy life. I think he was fulfilled. He probably felt there were things he could have done and didn’t get a chance to do. We never got really huge scale skyscrapers to design or things like that. I mean not that much of it. But in general, I think that he certainly kept busy. He never had periods of time where he just sat around waiting for something to happen. Either he was busy with things that came through the door, or he was writing books or doing lectures or whatever else he was doing that kept him occupied. He enjoyed travel. He enjoyed lecturing. [He made a] tremendous impact wherever he went. People tell me, “I met him in Sao Paulo in the mid-50s, and that was so impressive to me. I’ve never forgotten it.” Things like that, I hear those stories all the time. Frank Gehry is one of those who said he was impressed with Neutra when he first met him. Of course, everybody who has met my dad at some point recalls that as a high point in their careers. 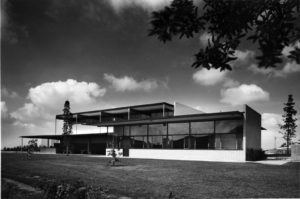 Scott Holleran: What was Richard Neutra like? Dion Neutra: Well, he was sort of a flamboyant kind of “starchitect”. I guess this is a good term for him because he stood out amongst the crowd. I think, in a way, he admired the thought that there could be an architect like Howard Roark. I don’t think he personally would have done the sort of thing [that Roark did in the novel]. Maybe he admired Roark for trying to do it. It’s a pretty idealistic view of an architect. 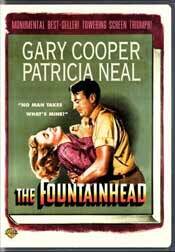 Scott Holleran: When did you read The Fountainhead? Dion Neutra: Not too long after it came out [in 1943], I think. I remember seeing the [1949 Warner Bros.] movie with Gary Cooper and Patricia Neal. They did a great job. It was good. Scott Holleran: What gives you a sense of wonder in today’s architecture? Dion Neutra: Well, I don’t name them specifically, but when I look at the publications and I see things like Renzo Piano has done interesting things here and there. I see projects that he’s done that I admire. I admire his, for example, museum in San Francisco [California Academy of Sciences] where he has a green roof, natural landscape happening on the roof and things like that. So, those are the kinds of things that I admire when I see someone like that doing that kind of work. More so than that strict formalism of Frank Gehry, which—I admire it, and I met him in the lobby of the [Walt] Disney [Concert] Hall one time. And he said, “You actually come to this place?” I said, “Oh, yeah. I have a season ticket.” So, we’re cordial. He was very supportive of me when I did [an] exhibition. Frank Gehry was one of the sponsors. Scott Holleran: What are your thoughts on Chicago’s Sears Tower, now the Willis Tower? Dion Neutra: Looking down from there is pretty exciting. Scott Holleran: What did you think of the Twin Towers before they were destroyed by Islamic terrorists? Dion Neutra: I remember being up there on the 102nd floor and looking out at the view from the restaurant. So, I made a point of visiting it when I was there in New York at one point. I’m so astounded that the whole thing just collapsed so easily just because it was hit by an aircraft at some point at the top. Why did that all collapse so badly is just—I never really quite understood that although I guess it has been written up. I think that the fireproofing was shown to be inadequate, which was part of the problem. It heated the steel and caused a failure because of that. They’ve got a new tower there that’s even taller. So, how is that going to fare when the next 500 mile-per-hour plane flies through there? What’s going to prevent that? Scott Holleran: Did your dad design a skyscraper? Dion Neutra: No. I don’t think so. Not that I know of. Scott Holleran: Do you think he would have liked to have built a skyscraper? Dion Neutra: I’m sure he would have. One thing that he did do that was interesting, toward the end of his life, he thought of the idea that skyscrapers should have greenery. So, we actually experimented in the basement of the VDL House with lights and a hydroponic system where we had liquids flowing around. And we were testing to see whether we could pump nutrients from the basement up to the eightieth floor and sustain life, greenery, on these balconies. And so, I saw recently in a magazine a highrise that was completely green with all this greenery bursting out of all sides of the thing. I was thinking my dad would have loved that. It was exactly what his vision was. I’ve never seen it quite to that extent as this particular publication. And I don’t know where the building is that that was showing, but there were two buildings close to each other. Each of them were developed this way. They had somehow found a way to get this greenery to be lush, no matter what side of the building it was, on all sides of the building it was lush. Wow, that’s perfect. Because to be on the 80th floor and be cut away from nature and be out there with nothing is not natural for us. That’s not where we are. So, to be able to import that and have that feeling up there no matter where you are, you still have some nature around you, that would be the idea. Scott Holleran: Do you consider yourself an environmentalist? Dion Neutra: Yeah, I do. Scott Holleran: Do you mean it as political activism or in the organic sense? Dion Neutra: I just mean it in the sense that we have to be stewards of the planet. Scott Holleran: Which is your favorite building in Manhattan? Dion Neutra: I like the Ford Foundation Building. It’s not necessarily very tall, but I love the interior environment they created there. Scott Holleran: Have you seen and done it everything you wanted? Dion Neutra: No, I haven’t done it all. I know that would be fun to do. I’m not thinking about that. I’m still active. As far as traveling and visiting, that would be a nice assignment—what are the five things I would most like to see? The Burj thing in Dubai, the highest building in the world, would be one of them. Because I’m astounded by the fact that they actually got that built. I’ve been to Mount Rushmore. I have not been to see the Arch [in St. Louis]. That would be fun to see.